The Bentley Rare Book Museum, housed within the department of museums, archives, and rare books at Kennesaw State University in Georgia, made its debut this past weekend. Formerly known as the Bentley Rare Book Gallery, established on campus in 1986, this re-branded space provides a free and open-to-the-public place to celebrate the written and printed word--the first ‘rare book museum’ in metro Atlanta. The Bentley Rare Book Museum holds a collection of about 10,000 items, with particular strengths in culinary history, Georgia authors, fine press books, Cherokee language materials, medieval manuscript leaves, and early printed books. Some of the highlights from the collection that you might see on exhibit in the future include Shakespeare’s Fourth Folio (pictured above), Dickens’ Bleak House and Nicholas Nickleby in their original serialized parts, and an Apollo 14 Lunar Bible, a microform Bible taken to the moon by Edgar Mitchell. A regularly rotating schedule of exhibitions is planned. The first and current set includes exhibitions on the history of the cookbook and on handmade artists’ books, plus an interactive exhibition of medieval manuscripts that encourages museumgoers to try out book-making tools. A micro-exhibition on the history of the Bentley Rare Book Gallery, originally designed to represent a middle-class English library c. 1760-1820, is also on view. The museum, located on the ground and second floors of Kennesaw’s Sturgis Library, is open Tuesday-Friday, 10 a.m. to 4 p.m. Images courtesy of the Bentley Rare Book Museum. 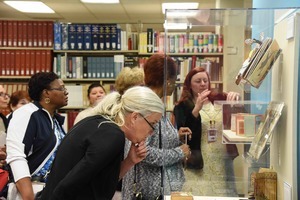 The Bentley Rare Book Museum, housed within the department of museums, archives, and rare books at Kennesaw State University in Georgia, made its debut this past weekend. Formerly known as the Bentley Rare Book Gallery, established on campus in 1986, this re-branded space provides a free and open-to-the-public place to celebrate the written and printed word--the first 'rare book museum' in metro Atlanta. As Kennesaw's rare books curator Julia Skinner put it, "Our main goal with the museum is to reach new audiences and make our materials more accessible. The gallery operates as an appointment-only space, and because of this we focused on using the space to teach classes or host researchers rather than as an exhibition space. The museum model allows for self-guided, drop-in tours during open hours, and also gives us the flexibility to do more outreach in the community." The Bentley Rare Book Museum holds a collection of about 10,000 items, with particular strengths in culinary history, Georgia authors, fine press books, Cherokee language materials, medieval manuscript leaves, and early printed books. 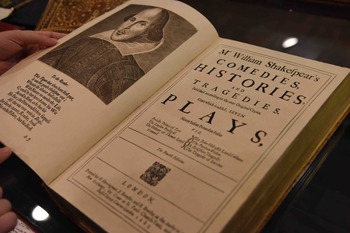 Some of the highlights from the collection that you might see on exhibit in the future include Shakespeare's Fourth Folio (pictured above), Dickens' Bleak House and Nicholas Nickleby in their original serialized parts, and an Apollo 14 Lunar Bible, a microform Bible taken to the moon by Edgar Mitchell. A regularly rotating schedule of exhibitions is planned. The first and current set includes exhibitions on the history of the cookbook and on handmade artists' books, plus an interactive exhibition of medieval manuscripts that encourages museumgoers to try out book-making tools. A micro-exhibition on the history of the Bentley Rare Book Gallery, originally designed to represent a middle-class English library c. 1760-1820, is also on view. The museum, located on the ground and second floors of Kennesaw's Sturgis Library, is open Tuesday-Friday, 10 a.m. to 4 p.m.